1. Can I cancel my contract? A key consideration when choosing your office phone line provider is understanding their terms and conditions. There are several uncertainties in running a business and as an owner, you need the flexibility to change your mind when it’s time. Many phone line providers, in an effort to maximize their profits, will lock you into costly long term contracts. There are several companies competing for your business, so you will find providers that do not require a contract and in many cases, their prices are well below what you are currently paying. If you’re like most small businesses, you’d probably like to avoid the hassle of having multiple points of contact when it comes to your phone service and telephone systems. The Federal Communications Commission has provisions that require providers to allow you to switch your current phone service provider even if you owe money or have a contractual agreement. Once you’ve done your research and identified your new provider of choice, your current phone line provider cannot refuse the release. 2. Can I keep my same phone number? Short answer: YES! Your telephone number is the primary lifeline to your customers, your advertising materials, and so much more. Keeping your same phone number is known as “number porting” and can be accomplished with all providers. Fortunately, the Federal Communications Commission allows you to switch service providers and keep your existing phone number as long as you are remaining in the same geographic or rate center area. VoIP internet based phone lines can be used with any number, but landlines have to be associated with an area code in the same region. Choosing a reliable company to handle the porting of your phone number is extremely important. If you’ve identified a new phone line provider, make sure they will do the heavy lifting for you once you’ve authorized the switch. Establishing brand new phone line service is not the same as porting from an existing carrier. We encourage finding a single full service provider that offers both phone systems and telephone lines. It is also a good idea to find out what perks or introductory offers are available. 3. Will it cost me to terminate my phone service? If you find yourself under long term obligations you might be able to avoid early termination fees. Some providers will not impose the early termination fee if you maintain at least one active phone line. For example, let’s assume that your carrier charges you $35 per phone line and you have 6 phone lines. In this case, you could cancel 5 of those 6 lines and allow your new phone line provider to service the remaining lines at a much lower rate (without incurring a early termination fee by your existing provider). If you find a provider that offers a more reasonable rate (some very attractive plans now start at $19.99/mo) you could save over 40% per month/per line while waiting for your existing contract to expire. Once the contract period ends, you will be able to move your remaining phone line(s) over to your new carrier and avoid the costly termination fee. Before switching, you will want to know the upfront cost associated with changing your phone line provider. Your new provider might have a one time fee for each phone number you are wanting to port over. This is usually a minimal onetime cost of about $10 t that will end up saving you hundreds of dollars over the lifetime of your service. 4. How long will it take to port my number to a new provider? The number of phone lines you are switching over. 5. Will my phone service be affected during the porting process? 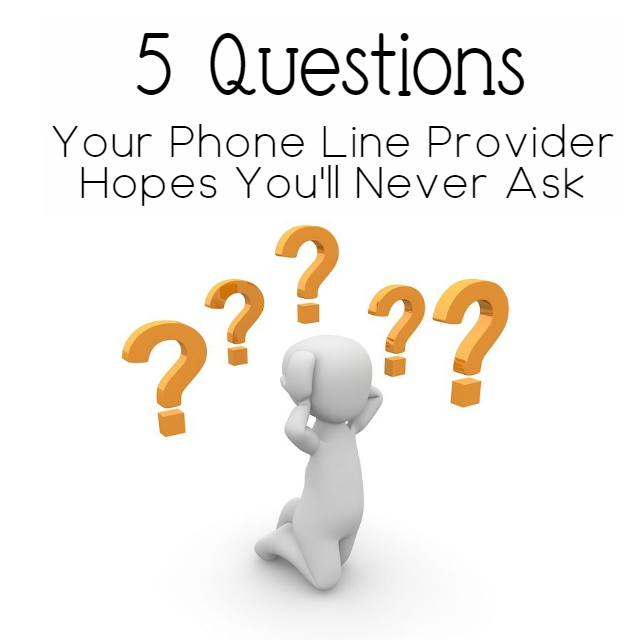 It never hurts to ask this question as you need a carrier that understands the importance of staying connected during the porting process. Most porting complications can be avoided by providing your new carrier accurate account information from your phone bill. Finding a provider that offers a temporary telephone line during the porting process is one technique to consider. Without your customers knowing the switch is in progress, you can activate the call forwarding feature with your existing carrier and have all of your calls forwarded to your temporary telephone number. All of your calls will ring into your system as usual, but when the port is complete, your new carrier has already set the published telephone number (number being ported) to ring directly to your office telephones. Before you make any changes, it is important to note the following information. First, you will want to review your current contract and understand the termination conditions if any. Second, to avoid customer service interruptions, it’s important to understand that you should never terminate your service before porting of your existing phone number to your new carrier is complete. If you terminate too early, this could interfere with porting from carrier to carrier. Convinced it’s time to switch? Allowing XBLUE experts to handle the switch means you can keep focusing on running your business. XBLUE currently offers free lifetime technical support on any XBLUE phone system when you purchase XBLUE telephone lines. XBLUE has many years of experience cooperating with the traditional telephone line providers and on average, they are able to successfully make the transition within a week. If for some reason your current phone line provider is unable to complete the port to XBLUE for reasons beyond our control, you will be provided a full-refund. XBLUE designs and delivers office phone solutions for businesses with 3 to over 300 employees. See how you can save money on your next phone bill or office phone system by visiting XBLUE. Complete a contact form and someone from our U.S. based product support team will help you design the perfect phone solution for your business needs. You can also speak to an XBLUE Business Communications Specialist Mon-Fri 8:30-5:00 pm central standard time at 866-925-8312.